In the larger scheme of public education and youth leadership training, history doesn’t always get its due. Maybe it’s the way the subject is shared, with too many lessons placing emphasis on the dry recounting of facts and dates. But history—good history—is about sharing stories. Stories of success, stories of failure, stories of grievous losses and glorious gains. What better way to learn about leadership than to explore intensely personal stories of real people making real choices about real challenges? In short, stories that speak to those qualities of character which make leadership possible. “I therefore call upon every man, whatever be his rank and condition in life, to put aside his business and come to the rescue of his country”. "If I can be of any service, I will go". And he did go, personally raising a regiment of 1,000 soldiers, teaching himself military strategy and heroically leading his troops in battle, quickly rising from second lieutenant to Brigadier General in the course of a few short years. 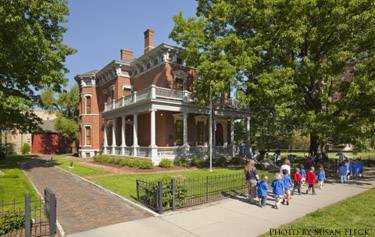 At the Benjamin Harrison Presidential Site, we are proud to carry on this legacy of leadership and civic education. Like Harrison, we're responding to the great challenge of civic leadership education for the next generation. In the summer of 2015, we piloted a new program called Future Presidents of America youth leadership camp, which focuses on helping to develop young leaders between the ages of 12 and 16. Over the course of a week, in this program students learn firsthand about the challenges and opportunities facing every president—from our country's heroic 18th century origins through the 23rd president and into the 21st century. They get to meet real-life statesmen, stateswomen, and inspiring community leaders, and explore the Presidential Site and its nationally-significant collection of more than 10,000 historic artifacts. We encourage them to share their voices in lively debates and discussions about what it means to be a good citizen, leader, advocate—or maybe even president. Every generation is faced with new and difficult decisions in life, but there is clarity in knowledge. Benjamin Harrison once said, “the bud of victory is always in the truth.” This applies whether learning about presidents, Civil war soldiers, or new citizens eager to exercise their civil rights. Telling the great stories of history lets us facilitate these important discussions about leadership within the context of real lives, inspiring personal conversations about decision-making and civic engagement with new audiences. What differentiates leaders—and diminishes some while elevating others—are the choices they are prepared to make. When called to service, whether for your family, your community or your country, how will you answer? Will you go? Charles Hyde is a native Hoosier and grew up in Indianapolis. He attended IPS School #86, #59, Eastwood Middle School and North Central High School. He majored in history at Hanover College in southern Indiana, and spent his senior year at the University of Oxford in England. After graduation, he spent 8 years at Conner Prairie Interactive History Park and subsequently directed the membership program and public campaign for orangutans at the Indianapolis Zoo. 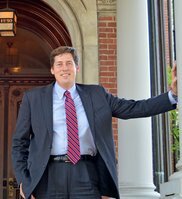 Since September 2014, Charlie has led the Benjamin Harrison Presidential Site as its new president & CEO. He guided the organization forward as it set itself a new five-year strategic plan with an ambitious vision to become to most innovative, impactful and civically-engaged presidential site in the United States. Charlie and his wife Samantha have two young boys and live on the northeast side of Indianapolis.